​The phrase “Pandora’s Box” is one of those expressions that appears in modern English that has its roots in Greek mythology, alongside the likes of “the Midas touch” and “Beware Greeks bearing gifts”. 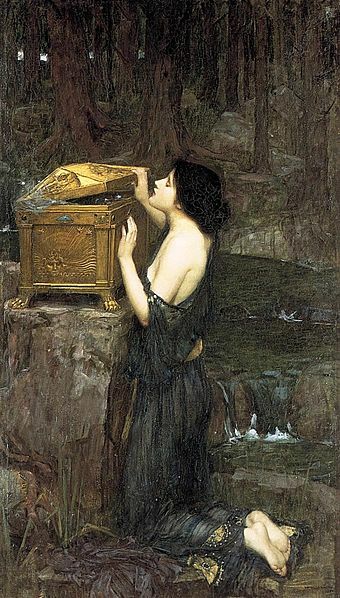 Today, the term Pandora’s Box is generally taken to mean the source of troubles or a gift that is actually a curse, but in Greek mythology, there was a physical “Pandora’s Box”. ​If based upon the ancient Greek myth, then it would be more correct to call Pandora’s Box, Pandora’s Jar, for the original Greek word for the box was Pithos meaning jar. ​Jars, including Amphora, were the common articles for storage and transportation of goods in antiquity. The change from Pandora’s Jar to Pandora’s Box only came about in the 16th century AD, when Erasmus of Rotterdam (Desiderius Erasmus Roterodamus) writing his work Adagia (1508) changed pithos to pyxis; pyxis meaning vessel with lid, or box. ​As the name suggest, Pandora’s Box belonged to Pandora, the first mortal woman, crafted by Hephaestus from clay, given life by Zeus, and imbued with characteristics by the other gods of Mount Olympus. Pandora was designed to be the wife of the Titan Epimetheus, and Pandora brought with her to the marriage a box given to her by Zeus, although Zeus had told her that the box was not be opened. ​Pandora was not a gracious gift from the gods to Epimetheus though, for Zeus had created Pandora to punish mankind. Epimetheus’ brother, Prometheus had stolen the secret of fire from the workshop of Hephaestus, and given it to man so that they would never be cold again, and Prometheus had also taught man how to make sacrifices so that the best meat of the sacrificial animals were kept for themselves, rather than the gods. For these crimes, Prometheus would be punished, for he would spend eons chained to a mountain in the Caucasus’s, but Pandora was part of a more convoluted plan by Zeus to punish man. Pandora brought to her marriage to Epimetheus not just her box, but also curiosity, one of the characteristics given to her by the goddess Hera. So despite the warning of Zeus, Pandora felt the urge to have a look inside the box that had been given to her. Eventually this urge was so great that Pandora decided to take a peek, and lifting the lid slightly (or removing the stopper), Pandora attempted to glance inside. Unbeknownst to Pandora, the gods of Mount Olympus had placed into the box all of the evils, things like toil, war, greed, disease and suffering; all things that had previously been unknown to mankind; and despite Pandora only opening the box slightly, the gap was sufficient to release all of these evils into the world. In the end only one thing was left within Pandora’s Box, and that was Hope. Due to the opening of Pandora’s Box, men now had to work to surviving, toiling in fields, and were now prone to injuries, illnesses and diseases for the first time. This generation of man would end with the coming of the Great Flood, although Pandora’s daughter, Pyrrha, and Prometheus’ son, Deucalion, would survive, but the suffering of man continued.